Brian's experience ranges from the entertainment industry to nature photography and personal and family portraits, however, a personal favorite is wedding photography. Brian enjoys working with the family to identify the most important shots and to provide a feeling of confidence - so they have one less thing to worry about on the wedding day. As an avid fisherman, Brian enjoys spending time at the Pine Lake Trout Club, both as a trout fishing pro and a nature and wedding photographer. Pine Lake serves as a great place to relax, learn fishing or to have a wedding or another special event. 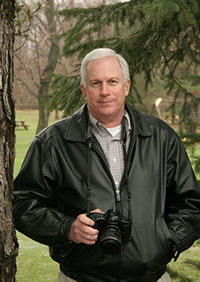 Brian Norcross is an award winning photographer with more than 25 years of experience. Brian's expertise includes private wedding coverage, nature photography and commercial work ranging from fashion photography to the entertainment industry. Not only does Brian have an eye for a great photo, he truly enjoys working with clients to capture the perfect image and guarantee their overall satisfaction. Use the links on the left to take a look at some of Brian's recent work. Brian can be reached via phone at: 440-286-5531 or via email at the address above.